Not so long ago, West Virginia's economy was on the ropes. The state suffered some of the worst setbacks since the Great Recession. Adding insult to injury, the Obama administration conducted its war on coal, a once-thriving part of West Virginia’s economy. But those days are over, and prosperity has returned to the Mountain State. 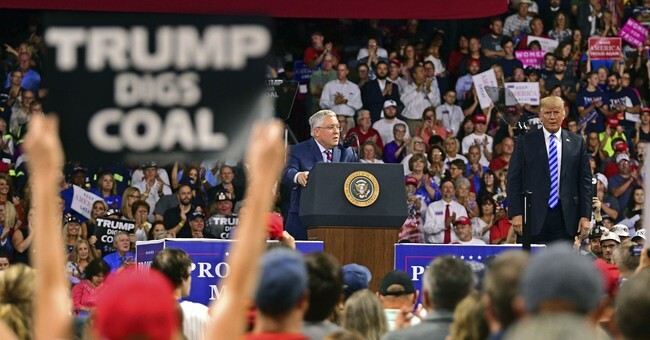 The president’s bold agenda of tax cuts and deregulation, and his plans to restore the state’s coal mining industry are already giving West Virginia hope for a better future. West Virginia’s economy is growing even faster than the national rate, thanks to the President’s focus on protecting American workers; and given the fact that quarrying, mining and oil and gas extraction are a big contributor to economic growth, it’s easy to see a bright road ahead of West Virginia. Many business leaders are also recognizing the positive effects of President Trump’s agenda. Mike Grose, a West Virginia coal industry executive, praised the President’s economic policies last year, arguing that the state’s coal miners are back in business. "[Mining employment] is growing, a lot better than it ever was," said Grose, an owner of a mining employment firm. "Once Trump was elected, I have increased staff 20-fold. Once he was elected, it went through the roof." The recent improvements in the state’s economy should not be taken for granted. Time and again, the Obama administration targeted miners across West Virginia, throwing thousands of families under the bus in an effort to appease green energy donors. In contrast to the shocking loss of mining jobs under Obama, the National Mining Association estimated that President Trump's agenda would "save 27,700 high-wage coal mining jobs along with another 99,700 in the coal supply chain including railroad workers, machinists, mechanics, truckers and other occupations that depend on coal mining." While Democrats are busy obsessing over the President’s tweets, the Commander-in-Chief has been on a mission to return thousands of jobs that have been stolen from America. President Trump’s tax cuts and deregulatory agenda, including his executive order to dismantle clean power rules, will undoubtedly stabilize West Virginia’s coal industry for years to come. West Virginians should be pleased with the direction of their economy today, but they should be asking more from their representatives in Washington. The Trump agenda, after all, will only be successful if it is supported by lawmakers who want to see their constituents prosper. Democratic Senator Joe Manchin is not one of those lawmakers. Manchin opposed tax cuts and argued that the GOP proposal will do little to help West Virginia. By echoing hollow criticisms, Manchin chooses to abandon a pathway to prosperity in favor of pointless partisanship. West Virginia's comeback story will end prematurely if the Democrats take over Congress in November. What will happen to the impressive economic growth if the Democrats double down on harmful regulations? What will happen to working families if the Democrats rescind crucial tax cuts? And what will happen to an estimated 13,000 West Virginia coal miners if the Democrats renew their campaign to kill the entire industry in favor of “green” alternatives? It’s clear that the West Virginia economy is running again like a champion fighter in the prime of his career. The stakes are too high and the moment is too great for us to choose Democrat disruption over continued growth at the ballot box. It ain’t broke, so let’s not try to fix it.